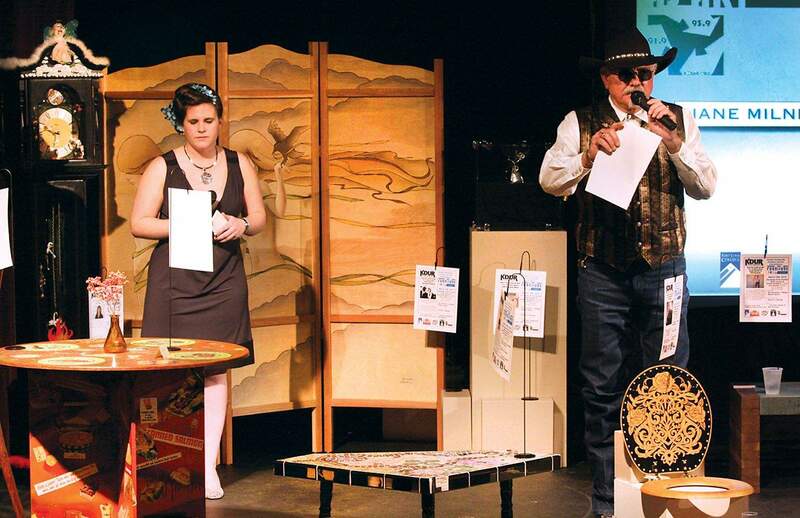 KDUR-FM Program Director Sarah Baumgartner and auctioneer Calvin Story are surrounded by donated artwork on the stage of the Durango Arts Center during last years Furniture as Art benefit auction for the radio station. While bidding was down in 2010 compared with recent years, the event is generally viewed by contributing artists as a positive experience in terms of the exposure the artists receive. Durango is a generous community. When charity is requested, contributions come from residents and businesses in the form of goods and services, cash, labor and volunteerism. And with hundreds of charities in the Four Corners, many donors are called upon again and again by the same groups. One tried and tested method for raising money is the sale of art, and whether it is in the form of furniture, clothing, accessories or a piece of art by itself, it is possibly the best bargain for art buyers anywhere. With so many talented and altruistic artists to choose from, our many charitable organizations can and do continually ask for their support. Most are quick to respond to the call and lend their creative efforts to be auctioned off for fun and profit. On the surface its a win-win situation; patrons get a bargain, the nonprofit gets money and the artist ... well, the artist often comes up one win short. Obviously, there are intangible rewards for donating to a person or group in need. In addition, most donors can receive a tax deduction for their donations  except when the IRS considers it intellectual property, which is how the agency categorizes artwork. Therein lies the inequity: Artists tend to be at the lower end of the economic sector, and constantly asking them to give away the one commodity they have with which to make a living is insensitive, if not unfair. Most charities recognize the value of art as a resource. But in the opinion of many artists, some value it more than others. Amy Vaclav-Felker, an artist and working mother, is dismayed by the constant requests for her work. Grow also shares a concern with many artists that their time and efforts, including costs like framing and materials, are undervalued. The disparity is even more magnified when the overall donation is evaluated relative to the artists often scant income. Art and money just belong to different universes. When we force them to mix, absurdities result. Even the most worthy charity request is an attempt to convert art into money, Grow said. Tirzah Camacho is another working mother who juggles her time raising children, waiting tables and continuing her painting career. Camacho said she is irked by the barrage of requests she receives from nonprofit organizations. Why on earth are artists so often asked to give away our art? (Its) like we just lay eggs and can hand them over due to the excess, she said. Ironically, Camacho faults not only the publics perception of art but the artists valuation of their own work. I feel the responsibility of the artist is to publicly value their work and to realize how their actions affect other artists. When artists give away their work, how is the neighboring artist going to get fair value for their art to feed their family? Camacho said. While many organizations need every penny they earn from the sale of art, others are following the lead of groups like the Conservancy, which splits proceeds 50-50 with the artists for the groups annual Snowdown art auction. For example, artists in the Womens Resource Centers upcoming Purse Design Exhibition event pay a fee and must be juried into the fundraiser, but WRC Marketing Director Deborah Uroda said proceeds from the silent auction will be split with the artists. Others, like Music in the Mountains, dont share proceeds with the artists, but they do acknowledge them and expose their work to the public. Executive Director Susan Lander said art is a reliable source for raising money for the annual festival, and she and her staff frequently solicit the art community for donations. She said the works are photographed and included in publications distributed to MITM patrons, and the artists also receive invitations to exclusive events and tickets to festival concerts where they are publicly acknowledged. We have tried very hard to make the artists feel valued for their donations as we know they are asked many times by many different organizations, Lander said. Although most nonprofits do value the art they receive, many artists agree that others need to better show their appreciation. Whether thats monetary payment, a public acknowledgement or a thank you note, it is important for the nonprofits to remember that donations of art often far exceed any monetary bequest made by other individuals.